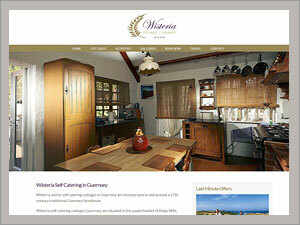 Wisteria Self Catering Guernsey. Web sites from Web Design by Bazil Guernsey. Wisteria and its self catering cottages in Guernsey are incorporated in and around a 17th century traditional Guernsey farmhouse known throughout the island for its outstanding floral frontage. Wisteria self catering Guernsey is situated in the quaint hamlet of Kings Mills, just a quiet walk through one of Guernsey's "Green Lanes" to the coast and beautiful Vazon Bay passing by La Grande Mare golf course. These 4 star country cottages with their polished wooden floors and beamed ceilings have been designed to provide cottage guests with comfortable Guernsey self catering accommodation in a traditional style.